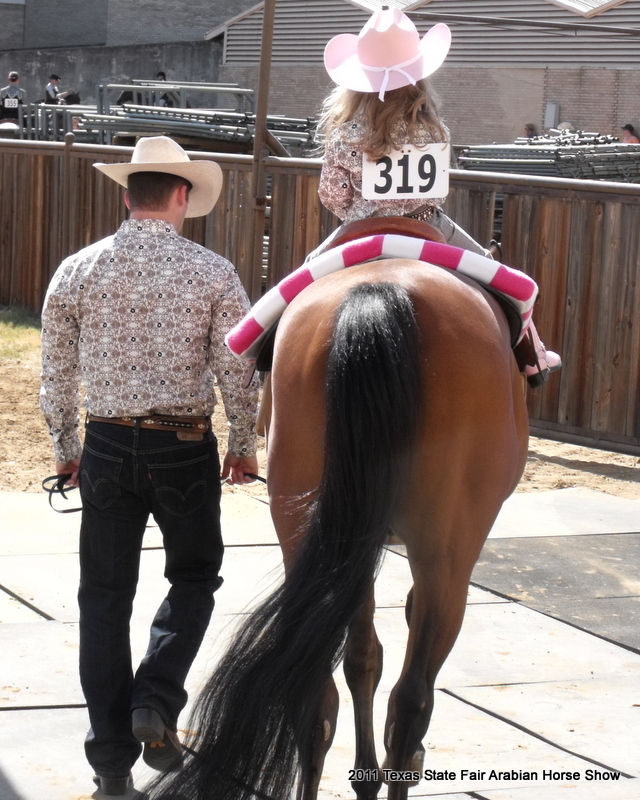 2011 Texas State Fair Arabian Horse Show -- some dreams do come true! I first saw Arabian horses at the State Fair of Texas Arabian Horse Show in 1964, when I was 8 years old. For the next 47 years, I dreamed of owning an Arabian horse, and showing my Arabian at the State Fair. Over the years, I did own Arabians, and I did show some of them, usually in local open shows; twice at Class A Arabian shows in Lubbock, and once in Dallas, but never at the State Fair Arabian Show. It became an item on my "bucket list" ... one of those things that I really wanted to do, someday ... but as my health deteriorated, it seemed less and less likely that this would ever happen. Leadline, ridden by Caroline Davis, age 4 -- blue ribbon. Thank you to Lisa, Doris, Michelle, Nicole & all who helped make this dream a reality. 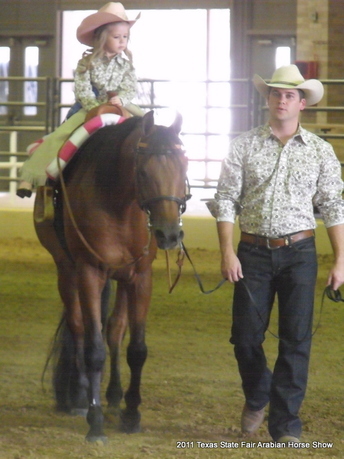 Lord willing, I hope that Alex and I will see you again next September, at the 2014 Texas State Fair Arabian Horse Show.